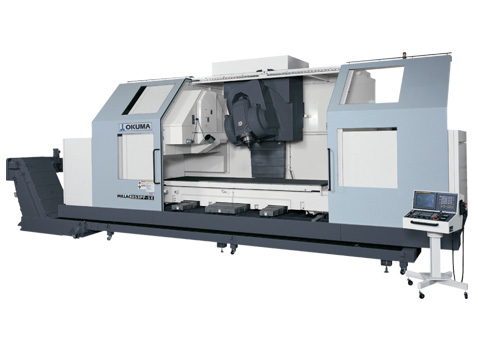 The MILLAC 853PF-5X performs process-intensive machining of materials like aluminum to titanium, ideal for producing aerospace airframe and wing spar components. The five axes (X,Y,Z,A,B) are based on a powerfully built machine structure and use cast-iron box ways to deliver maximum strength and minimum friction. The full enclosure shield protects the operator from splashing coolant and flying chips, and the pedestal-mounted operator's panel can be rolled to any position.